Featherstone Weightlifting Club members who enjoyed success at the British Development open exhibition event. Featherstone Weightlifting Club youngsters have met with more success with under 13 teams doing well in the inaugural British Development open exhibition event at the Ricoh Arena, in Coventry, and the Northern England Schools Championships, in North Shields. At the British Development Open – an event that ran alongside the British Senior Championships – Mackallan Whitley, of All Saints, Featherstone, Oliver Tepper, of Half Penny Lane, Pontefract and Jack Hawkins, from Hemsworth High School, all lifted superbly. They achieved a number of personal bests in giving a fantastic example of young lifting and what they could achieve in the future. The children were coached on the day by former European champion and current silver medallist Martyn Riley who won the 56kg 35-39 Masters open and was awarded the British Weightlifting Unsung hero award. Fellow Featherstone club member Sharon Tepper also travelled down as an official for the event, working as a referee, time keeper and speaker. Last weekend the club took seven lifters to the Northern Weightlifting region schools event at North Shields. 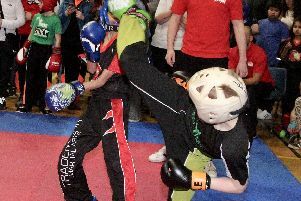 Kobain Riley, a four-time British Schools champion, won his tenth regional event, representing the Highfield School, as did younger brother Wesley, who was winning his fourth regional title. Fellow siblings Oliver and twin sister Lily Tepper, who attend Half Penny Lane, Pontefract, both lifted competition personal bests as they claimed yet more regional titles each. Also making competition personal bests were Jake Hawkins and Leon Cockerham, of St Thomas, Featherstone, and the club’s youngest representative on the day, Chloe Hutchinson, as all the lifters won. In fact only one lift was missed between them out of 42 attempts. The depth and quality of the coaching team was also on display as this time international referee Martyn Riley acted as centre official and technical points scorer on the day – children under 13 are given technique points added to their final total to promote correct and safe lifting. Northern champion and record holder Sharon Tepper took the lead coach role for the first time excellently with great support from two-time European Masters silver medallist Justine Davis, former British champion and club vice president Tom Smith and vastly experienced coach and ex-international lifter Bob Jackson. Kids sessions run at Featherstone Weightlifting Club on Mondays and Wednesdays 5-6pm at £1 a week for both sessions. First session is free and they do not just focus on competition lifting as strength development can also be offered. The club also has also had great adult success with multiple British and international medallists at the club, including Mark Wager, Andy Philips and James Smith alongside the successful coaches at the club. Adult sessions run Monday, Wednesday and Fridays, 6-8.30pm at £3 a week, again the first session free.